The Site: Green Cove, Cape Breton, NS, Canada. LANDinc explored the site selection process and vision for Canada's only National War Memorial honouring the war dead that were never brought back to Canadian soil. Over 100,000 soldiers in 6,000 cemeteries never returned and are honoured through a memorial design that expresses the human experiences of departure, remembrance and reflection. 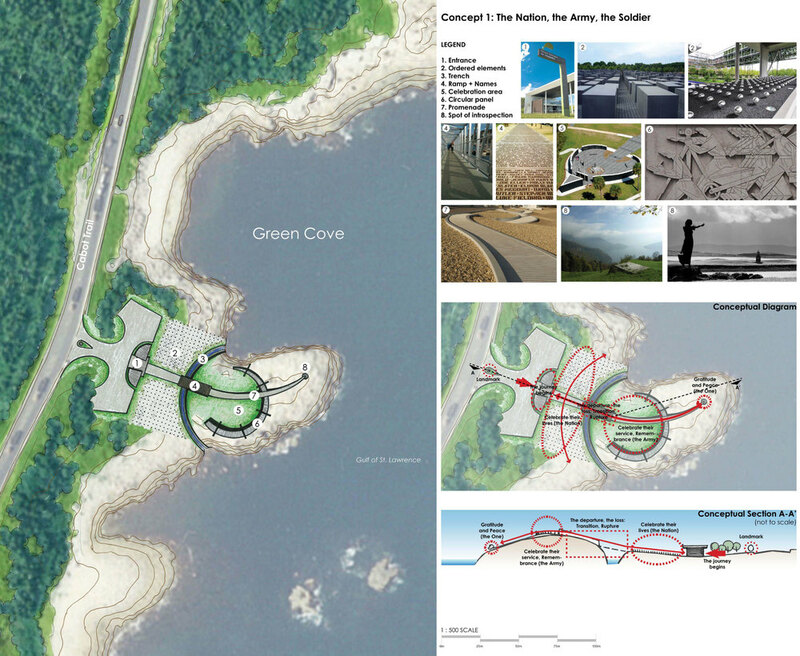 The proposed elements of the design are envisioned to lightly touch the pristine East Coast shorelines of the Cabot Trail - a Canadian National Park. LANDinc further advised on the Client's vision for a statue - "Mother Canada" to be incorporated into an international design competition that explores contemporary expressions of reflection. A process of site investigations, environmental assessments, community outreach and a thorough business case were proposed for future project phases to ensure programmatic elements and site conditions are suitable for the evolved vision for the National Memorial.